2010-06-07. New. Ships with Tracking Number! INTERNATIONAL WORLDWIDE Shipping available. Buy with confidence, excellent customer service! Wiley-Blackwell. Hardcover. 1405100141 New Condition *** Right Off the Shelf | Ships within 2 Business Days ~~~ Customer Service Is Our Top Priority! - Thank you for LOOKING :-) . New. Wiley-Blackwell, 2010-01-19. 2. Hardcover. Used:Good. 1999-11-15. Good. Ships with Tracking Number! INTERNATIONAL WORLDWIDE Shipping available. May not contain Access Codes or Supplements. May be ex-library. Shipping & Handling by region. Buy with confidence, excellent customer service! Wiley-Blackwell. PAPERBACK. 140510015X BRAND-NEW, Unread Copy in Perfect Condition. FAST UPS shipping (you'll receive your order within 1-5 business days after shipping in most cases*), this helps to ensure your order arrives in perfect condition. PLEASE NOTE: FedEx does not generally deliver to PO Boxes or APO addresses, so please be sure to give us a physical street address to deliver to; also, unfortunately, we cannot ship this item to Alaska or Hawaii. THANKS! *(this applies to domestic shipments within the continental US - other destinations may take longer) . New. Wiley-Blackwell, 2010-01-19. Hardcover. New. Appears unused. We ship daily! Wiley-Blackwell, 1999-11-15. 1. Hardcover. Used:Good. Blackwell Pub, 1999-09. Hardcover. Good. Wiley-Blackwell, 1999-11-15. 1. Paperback. Used:Good. Wiley-Blackwell. PAPERBACK. 140510015X New Condition. . New. Wiley-Blackwell. PAPERBACK. 140510015X Like New Condition. . Fine. Wiley-Blackwell. PAPERBACK. 063120296X New Condition. . New. Wiley-Blackwell. PAPERBACK. 140510015X Brand New ,Original Book , Direct from Source , Express 5-8 Business days worldwide Delivery. . New. Wiley-Blackwell, 2010-01-26. 2. Paperback. Used:Good. Paperback. New. Archaeological Theory: An Introduction, 2nd Edition is thoroughly updated and enhanced to reflect the latest thinking in archaeological methods. Expanding the popular first edition, Matthew Johnson utilizes clear and accessible language to examine the roots of contemporary debates in the development of archaeology over the past three decades. Wiley-Blackwell. PAPERBACK. 063120296X Like New Condition. . Fine. Blackwell Publishing/Atlantic Publishers & Distributors (P) Ltd, 2002. Hardcover. New. Archaeological Theory: An Introduction is a book that has been needed for the last twenty years. It is an accessible, lively account of current thinking in archaeology. Taking a historical approach and using clear and jargon-free language, the book examines the roots of current debates in the development of archaeology over the last thirty years. Mathew Johnson discusses different ways of approaching the Human Past, ranging from positivism to Postmodernism. He conveys to students that theory is important and can be exciting and stimulating. He reveals the historical origins of different schools of thought and sets theories against the practical problems they are intended to solve, as well as against wider developments in other disciplines. The book discusses what the new Archaeology meant and means, what the differences are between processual and post processual archaeology, what cognitive archaeology is or might be, and addresses politics, gender and evolution within archaeological theory. The author outlines the social and political context of different intellectual tends and provides a route map to a complex and much debated area of the subject. This introduction will be invaluable not only to students encountering archaeology for the first time, but also to archaeologists of all areas and periods needing a lucid and concise guide to current thinking and terminology. Printed Pages: 256. Blackwell, 2019. Paperback. New. Brand New, Never Used, IN-STOCK, Well Packed. Orders ship the same or next business day. Shipping should take from 3-4 business days within US, Canada, UK, and other EU countries, 2-3 business days within Australia, Japan, and Singapore. Customer satisfaction guaranteed. Mail us if you have any questions. Wiley-Blackwell. Paperback. GOOD. Spine creases, wear to binding and pages from reading. May contain limited notes, underlining or highlighting that does affect the text. Possible ex library copy, thatâll have the markings and stickers associated from the library. Accessories such as CD, codes, toys, may not be included. UK: Wiley-Blackwell, 1999. Soft cover. Very Good. 8.9 x 5.8 x 0.7 inches. p/b 239 pages, condition is very good. 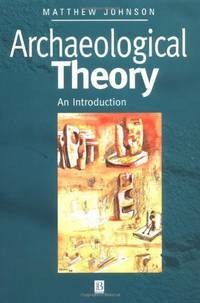 This is a lively overview of the major ideas and concepts in archaeological theory. Wiley-Blackwell. Paperback. 063120296X . Good. 2002. Maldon. MA: Wiley-Blackwell, 2004. 239pp. Underlining on a few pages. Stains on the bottom edge of the text block.. Ninth Printing. Soft Cover. Good/No Dust Jacket. 8vo - over 7¾" - 9¾" tall. Wiley-Blackwell. 240 pages. Private large stamp on end paper. Clean paperback with a clear plastic adhesive protector on cover. Paperback. Archaeological Theory: An Introduction . Good. Soft cover. 1st Edition. 1999. Wiley-Blackwell. Used - Very Good. Ships from Reno, NV. Former Library book. Great condition for a used book! Minimal wear. 100% Money Back Guarantee. Shipped to over one million happy customers. Your purchase benefits world literacy! Wiley & Sons, Incorporated, John, 1999. Paperback. Acceptable. Disclaimer:A readable copy. All pages are intact, and the cover is intact. Pages can include considerable notes-in pen or highlighter-but the notes cannot obscure the text. Wiley & Sons, Incorporated, John, 1999. Paperback. Very Good. Disclaimer:A copy that has been read, but remains in excellent condition. Pages are intact and are not marred by notes or highlighting, but may contain a neat previous owner name. The spine remains undamaged. At ThriftBooks, our motto is: Read More, Spend Less.Dust jacket quality is not guaranteed. WileyBlackwell, 09/03/1999. Paperback. Used; Good. **WE SHIP WITHIN 24 HRS FROM LONDON, UK, 98% OF OUR ORDERS ARE RECEIVED WITHIN 7-10 DAYS. We believe you will be completely satisfied with our quick and reliable service. All orders are dispatched as swiftly as possible! Buy with confidence! Wiley & Sons, Incorporated, John, 1999. Paperback. Good. Disclaimer:A copy that has been read, but remains in clean condition. All pages are intact, and the cover is intact. The spine may show signs of wear. Pages can include limited notes and highlighting, and the copy can include previous owner inscriptions. At ThriftBooks, our motto is: Read More, Spend Less.Dust jacket quality is not guaranteed.